The deadly landslide that struck Oso, Washington in 2014 may not have been an isolated incident, a new study warns. 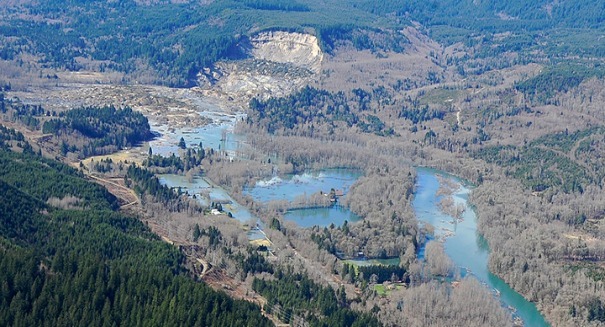 A 2014 landslide near Oso, Washington devastated the local community when it happened, but scientists are warning that the disaster may not have been a fluke. According to a report from UPI, a new study published in the journal Geology reveals that landslides in the region are actually quite common. The landslide in Oso in 2014 left an entire neighborhood buried and killed 43 people. The region in Snohomish County has a long history of landslides and other geologic activity. By using carbon dating techniques to determine the age of the debris in the area surrounding the landslide site, the researchers found that similar landslide events have occurred within the past few hundred years. They even found evidence of a landslide, known as the Headache Creek slide that happened 6,000 years ago. Despite the discovery of ancient debris among the landslide sites, the researchers only needed two dates to determine how old most of the other slides in the area were. They plotted their findings on a “roughness-age curve,” revealing that the most recent geological event, the Oso landslide, was a part of a larger series of slides in the region. The new assessment of the rate of geological movement in the region give local officials a more clear picture of the risks facing the people who live in Snohomish County. The study will allow scientists to give advanced warning of an approaching event to the residents in the area. “This is the first time this calibrated surface dating method ahs been used for landslide chronologies, and it seems to work really well. It can provide some information about how often these events recur, which is the first step toward a regional risk analysis,” said LaHusen. A press release from the University of Washington describing the details of the study can be found here.